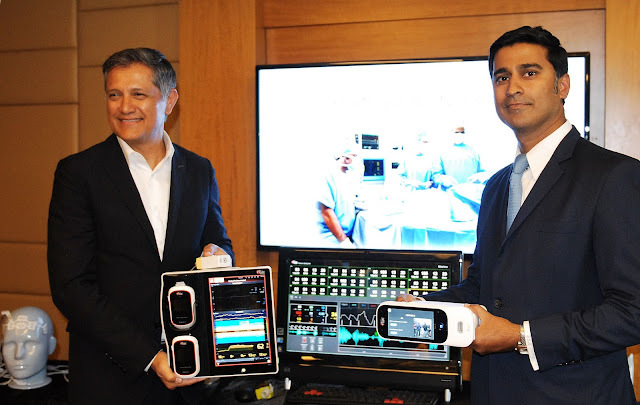 Masimo announced the launch of Rad-97™ Pulse-CO Oximeter®* & Next Generation Sedline®* Brain Function Monitoring in India. 1. 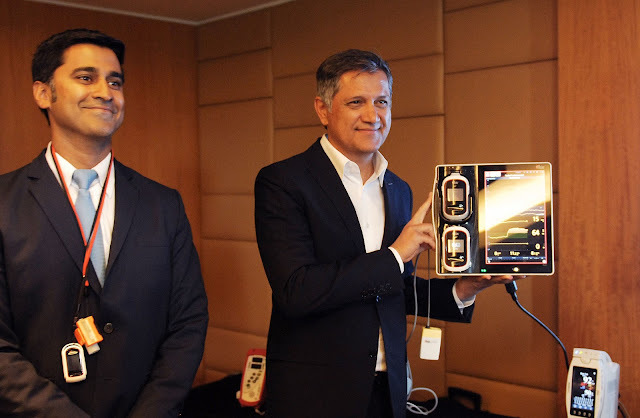 L-R : Mr. Joe Kiani, Founder and CEO, Masimo and Bharat Monteiro, Masimo Country Manager for India, launched their new range of medical device at the press conference held today. Bangalore, India – January 2, 2017 - Masimo (NASDAQ: MASI) announced today the launch and availability of the Rad-97™ Pulse-CO Oximeter®* and Next Generation Sedline®* Brain Function Monitoring in India. 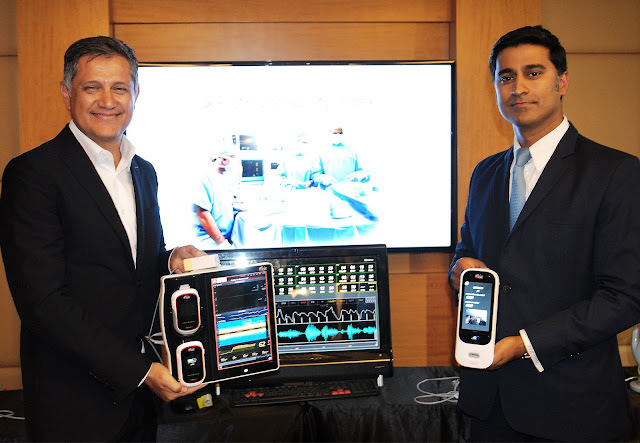 The announcement was made in Bangalore by Joe Kiani, Founder and CEO of Masimo, at a roundtable of the CEOs of top Bangalore hospitals. Rad-97 features Measure-through Motion and Low Perfusion™ SET® pulse oximetry, which studies have shown helps clinicians reduce severe retinopathy of prematurity in neonates,1 improve CCHD screening in newborns,2 and, when used for continuous monitoring in post-surgical wards, reduce rapid response activations and costs.3,4,5 Rad-97 also offers the same upgradeable rainbow SET™ technology as the Radical-7® Pulse CO-Oximeter, in a versatile, standalone monitor configuration. Using Rad-97, clinicians can monitor such rainbow® measurements as total hemoglobin (SpHb®) and PVi®. Studies with SpHb have shown reductions in unnecessary blood transfusion†,6,7 and when used with PVI, reductions in length of hospital stay8 and 30- and 90-day mortality.9 rainbow® can also measure methemoglobin (SpMet®), acoustic respiration rate (RRa®), carboxyhemoglobin (SpCO®), Oxygen Reserve Index™* (ORi™), and oxygen content (SpOC™). Rad-97 also features an integrated camera* for clinician tele-presence via Patient SafetyNet™‡ and a high-resolution 1080p HD color display with user-friendly multi-touch navigation, similar to Root® and Radical-7, allowing clinicians to easily customize the device to best suit their monitoring needs. SedLine features four simultaneous EEG leads to enable continuous assessment of both sides of the brain, as well as a Density Spectral Array (DSA), an easy-to-interpret, high-resolution display of bi-hemispheric activity. Next Generation SedLine enhances Masimo’s processed EEG parameter, the Patient State Index (PSI), to make it less susceptible to electromyographic (EMG) interference and to improve performance in low-power EEG cases. *Rad-97, the camera feature, Next Generation SedLine, and ORi do not have 510(k) clearance and are not available in the U.S.
†Clinical decisions regarding red blood cell transfusions should be based on the clinician’s judgment considering, among other factors: patient condition, continuous SpHb monitoring, and laboratory diagnostic tests using blood samples. ‡The use of the trademark SafetyNet is under license from University HealthSystem Consortium. Masimo (NASDAQ: MASI) is a global leader in innovative noninvasive monitoring technologies. Our mission is to improve patient outcomes and reduce the cost of care by taking noninvasive monitoring to new sites and applications. In 1995, the company debuted Masimo SET® Measure-through Motion and Low Perfusion™ pulse oximetry, which has been shown in multiple studies to significantly reduce false alarms and accurately monitor for true alarms. Masimo SET® is estimated to be used on more than 100 million patients in leading hospitals and other healthcare settings around the world. In 2005, Masimo introduced rainbow® Pulse CO-Oximetry technology, allowing noninvasive and continuous monitoring of blood constituents that previously could only be measured invasively, including total hemoglobin (SpHb®), oxygen content (SpOC™), carboxyhemoglobin (SpCO®), methemoglobin (SpMet®), and more recently, Pleth Variability Index (PVi®) and Oxygen Reserve Index (ORi™), in addition to SpO2, pulse rate, and perfusion index (Pi). In 2014, Masimo introduced Root®, an intuitive patient monitoring and connectivity platform with the Masimo Open Connect™ (MOC-9™) interface. Masimo is also taking an active leadership role in mHealth with products such as the Radius-7™ wearable patient monitor and the MightySat™ fingertip pulse oximeter. Additional information about Masimo and its products may be found at www.masimo.com. All published clinical studies on Masimo products can be found at http://www.masimo.com/cpub/clinical-evidence.htm.